TNW2019, our tech conference in Amsterdam, is all about discussing the future of technology. Whether you’re a developer, marketer, artist, or entrepreneur, there’s an interesting discussion that you’ll want to join. That’s why we’ve divided up our keynote talks into 11 tracks – to help you decide which ones will be the most personally relevant. On our main stage, we’re inviting some of the biggest names in tech to share their visions of the future. This track is for the larger, overarching questions: How will we interact with each other in the future? How will we get around? And how will we live our day-to-day lives? Marketing and technology have become increasingly intertwined – so how can brands use new technology to reach the right people? And how can we remain authentic in an age of AI and automation? Re:Brand’s expert speakers will explore the latest trends and how they can help your brand create meaningful experiences for your audience. You’ll hear innovative use cases from exciting companies, like National Geographic and Venngage. Hear from the founders and CEOs of wildly successful companies about how they grew their startup. As any entrepreneur knows, it’s no easy feat – especially now, when the competition is fiercer than ever before. So how can startups achieve that growth – and do it sustainably? Once it happens, how can you maintain company culture as your team expands? These are the kinds of questions that the leading experts will be answering in the Growth Quarters track. If you’re an entrepreneur or interested in scaling a startup, don’t miss it. It’s no secret that cryptocurrency has had its literal ups and downs. Through it all, it’s remained clear that blockchain has changed the tech industry as a whole. A few questions persist before we can see that happen: How can we achieve scalability and mass adoption? How can we create a diverse and equal industry? And how will we raise capital in the future, as the popularity of ICOs dwindle? The biggest names in the industry share their strategies and predictions for overcoming these issues at the Hard Fork track. Don’t miss speakers like Yoni Assia, CEO of eToro, speak. It’s safe to say that the 9 to 5 mentality is over. Company cultures are evolving to recognize the needs of their employees. The future of work is changing – so what will our offices look like in 20 years? Will these changes make us more productive? And which leadership skills will we value in the future? At Future of Work, our impressive lineup of speakers will explore how the traditional office will transform – from HR to the architecture of the building, and everything in between. Co-hosted by leadership and company culture consultancy Heidrick & Struggles, the track will feature talks from David Allen, best-selling author of Getting Things Done, Marcus Wermuth from Buffer, and more. How will we interact with digital products in the future? As we rely on technology more and more, product teams are tasked with the difficult challenge of shaping that daily experience. So what are the latest trends that we should know about? And how can we build and design products that are used by everyone? At TNW2019, developers, designers, and product owners from the world’s biggest brands will show you how they’ve built beautiful, functional, and memorable digital products. Don’t miss the talks from Stephanie Hannon (Strava), Angel Diaz (IBM), and Jonathan Rochelle (Google) at the Sprint track. 📢🔥 TNW2019 SPEAKER: @twephanie, CPO of @Strava! She was the first female CTO of a presidential campaign, for Hillary Clinton. Our ecommerce track explores how new tech is changing the game of ecommerce, and how companies can embrace them to stay on top. How are they capitalizing on AI, AR, and more? How can smaller companies establish themselves with stiff competition? The Checkout track will explore what customers can expect to see in their online shopping experiences. Hear from the experts, including Jack Constantine (CDO at Lush) and Pamela Kaupinen (SVP of Strategy at HelloSociety). It’s becoming clearer that artificial intelligence is going to radically change how we live our lives. The question remains: how can we prepare for it? From future career skills to which aspect of our world it’ll change first, our speakers will answer the burning questions we all have. At the Machine:Learners track, we explore the future, real-world applications of AI and neural science. How can we use technology for good? The UN’s 17 sustainable development goals can all be achieved through the latest innovation. So when, where, and how can we do it? Whether you’re a policy maker, a company looking to go green, or simply want to do your part, our motivating speakers will give relevant insights into how tech can help us. Hear from experts making the world a better place, including Sandy Fershee (Ford). Want to learn more? Check out the Future Generations track. How will our creativity evolve as technology advances? Through Photoshop and VR, the way we produce and share art is already changing – so what’s next? How will tech impact the way we value and perceive art? The Art of Tech track features prominent artists, digital designers, and creatives who will share the ways that they’ve incorporated tech into their creative process – and how they envision technology opening up new opportunities to express their imagination. The future is female. As we continue making moves towards a gender equal world, what are the growing opportunities for women to work in the male-dominated tech industry? And how can we use tech to close the gap itself? Hosted by TheNextWomen, this track is all about in-depth workshops and inspiring keynotes from successful women in tech. Join these empowering discussions if you want to break the glass ceiling. Want to learn more? Check out all the details about TheNextWomen Summit. 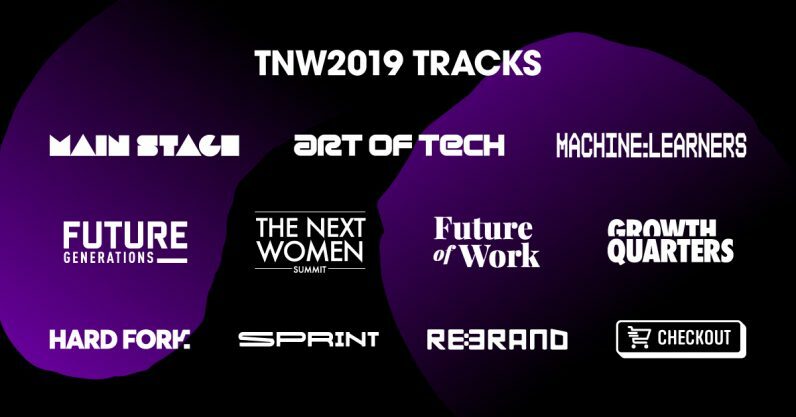 There you have it – the 11 major tracks we’ll be exploring at TNW2019! No matter what area of tech you’re in, you can be sure our diverse speaker lineup will provide you with inspiration, actionable learnings, and motivation. Don’t miss out on our best edition yet – get Earlybird tickets before prices rise!